Small and stylish, the Cryo is far from perfect but for the money there are few better choices. From the key specs above you’ll notice that this knife is particularly inexpensive. While many get excited about low prices it usually sets off some warning bells with me. That said, we have been proven wrong many times as many of the top brands have put very good knives on the market which cost relatively little. So, just because a knife is “cheap” doesn’t necessarily mean it ought to be crap. One great example is the Spyderco Tenacious which is about the same price as the Cryo and faired very well in our recent video review. The Cryo is intended to be an all-purpose EDC and equally useful on the campground as it is in the home. As I was reviewing the Cryo I found myself comparing it to the Tenacious in many ways. Both made in China, the first thing that jumped out at me was that the Kershaw Cryo is a noticeably smaller knife than the Tenacious and yet weighs more! Well, not much more but specifically, the Cryo weighs about 4.2 ounces compared to 4.0 with the Tenacious. Further inspecting the measurements we see the Cryo is about 6.5 inches long when opened as compared to almost 8 inches for the Tenacious. It’s blade uses the same 8Cr13MoV stainless steel as the Tenacious but is only 2.75 inches long versus just under 3.4 inches on the Tenacious. Finally, when closed the Cryo measures about 3.75 inches compared to almost 4.5 inches for the Tenacious. So, with these stats in mind why the hell is the Cryo heavier than its larger Spyderco competitor? 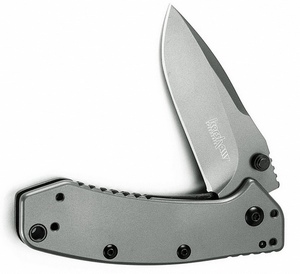 Well a big part of the reason is Kershaw’s decision to go with the stainless steel handle (see below) but also in my opinion the Tenacious is simply a superior design compared to the Cryo. There…I said it. Now, please don’t take that to mean the Cryo is a loser. Far from it. Despite is relative weight problem it actually feels quite comfortable in the hand and still perfectly suited as an EDC. Speaking of the 8Cr13MoV steel, this is a Chinese all-round mid-range steel (some would even say “budget”) that is somewhat comparable to the Japanese AUS-8 steel. I find it holds an edge reasonably well, maybe a little soft but very easy to resharpen as a result. The look and shape of the blade itself is quite striking and reminded me of other Hinderer models from Kershaw’s higher end Zero Tolerance line like the ZT 0561. The belly is decent and the tip is fairly slender yet tough. Really, for under $40 the Chinese made blade you find here and with the Tenacious is about as good as it’s going to get – which is actually pretty decent all being considered. The blade locks up using a framelock mechanism utilizing the stainless steel interior. Overall it’s pretty solid though there was some blade play in the knife I reviewed, maybe a hair more than the Tenacious had but the blade was well centered. The Cryo sports a spring-assisted deployment similar to the Ken Onion Leek and rides on phosphor bronze bushings just like the Tenacious to ensure a frictionless motion. It sure does open fast and sleek. Kershaw decided to include both a flipper arm on the back as well as thumb studs on the blade for opening. I found the flipper works pretty well but I struggled a little with the thumb studs. To be honest they probably weren’t needed and feel like a waste. The Cryo’s handle is titanium-carbo-nitride coated stainless steel. It looks great but I find it’s sub-par compared to the G-10 you find on the Tenacious when it comes to overall grip. Now, for most applications you won’t find an issue but when the times comes when it’s raining and you’re in an emergency situation you may be wishing you had G-10. Still, the jimping found on the top of the blade and bottom of the handle does help. In other lower-priced offerings from Kershaw we’ve been accustomed to seeing the black fiber reinforced nylon (FRN) so at least the Cryo offers something a little different in that department. Like the Tenacious the Cryo is an open design meaning water or whatever will simply flow through the body of the knife – a design which makes it easy to clean and I do like that a lot. All in all it’s a reasonably sturdy design and I found the finish exceeded my initial expectations. Kudos to Kershaw in that department. For such a small knife it actually holds pretty well in the hand. You should have no problem for most routine applications and only when the going gets tough might you wish you had something a little bigger and more comfortable. The Cryo’s pocket clip is black coated steel and can be oriented on either side and for tip up or down carry. A nice touch offering plenty of flexibility depending on your situation. The Cryo rides pretty low in the pocket with this clip. In wrapping up, I can say that I was reasonably impressed with Kershaw’s Cryo. It’s a great looking EDC which is far from the performance or feature-set of the $100+ offerings but for this price it’ll satisfy most customers. That said, I do not think it’s as impressive as the Spyderco Tenacious which is about the same price but edges out the Cryo in a number of departments as is in general a better design in my opinion. That said, if you’re in the market for something a little different and a knife that stands out from the crowd then the Cryo will not disappoint. I kind of wished Kershaw had beefed this up a little and made it more of a competitor to, say, the Griptilian. On that note – Kershaw has released the Cryo II which is 20% larger than the original Cryo with a 3.25 inch blade! I hope you appreciate this review and as always feel free to get in touch with any questions you have. The Good: Small, sleek and near perfect size for general use EDC. Nice finish and overall construction. Affordable. The Bad: A little heavy for what it is. Some minor blade play. Average blade.. Bottom-Line: A decent EDC for those with low budgets and looking for an alternative to the Spyderco Tenacious.